Like our previous popular ‘Fear and Horror’ set, ‘Apocalyptic Visions’ brings you yet more disturbing pads, insane soundscapes and creepy sound effects. We also took the liberty of expanding this collection with semi-real fantasy musical instruments, dark dubstep basses and more, to give you an even better experience. 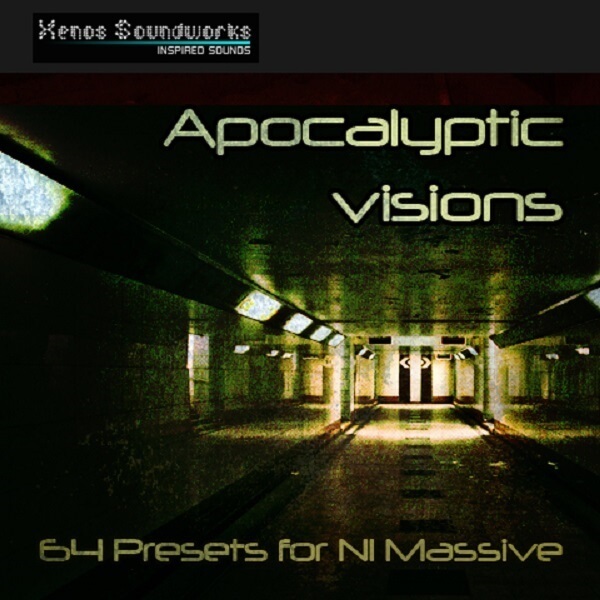 “Apocalyptic Visions” is aimed at producers of horror and sci-fi soundtracks, plus those who produce a wide variety of other genres: dark ambient, dubstep, drum & bass, psychill, future garage, IDM, industrial, and even death metal. ‘Apocalyptic Visions’ contains 60 patches, each with all 8 Macros assigned, plus entertaining commentary in the “comments” box for each patch. Most of the comments are fictional diary entries outlining a post-apocalyptic story to immerse you in the experience and can help inspire song ideas. Please note that this set is in NMSV format only. When I made this set, I didn’t want this to just be “Fear And Horror Volume 2”, so I aimed for a colder, more metallic overall sound, which is more fitting for something “post-apocalyptic” – rusted, twisted metal husks that were once buildings, biting cold nuclear winters, constant paranoia, etc. The addition of semi-real musical instruments also reflects what some musical tools fashioned from bits of wire and old gas cans might sound like. Check out the patch “KB Unprepared Piano”. It’s my personal favorite and sounds EXACTLY like a distressed, prepared grand piano!